As many of you know, search engine optimization (or SEO) has been a big business focus for me. I’ve built a portfolio of niche websites and also worked in SEO for larger businesses, and have seen a ton of data on what works and what does not. In the last few years, the world of search engine optimization has become a competitive and lucrative space, with numerous companies jockeying to rank #1 in the results for competitive keywords. This has led to a lot of the so called “black-hat” tactics, which seek to maximize traffic and profits from search without providing high quality content in return. On the other hand, Google’s business objective is to provide the most relevant content to its users, regardless of how much profit the content creators are making. Creating a high-quality user experience is the only way Google will stay relevant in an increasingly competitive search engine universe. With that in mind, Google announced major change to their search engine results on Thursday, February 24th. 11-12% of all results have been affected, which is the single biggest change that I’ve seen in years. In their announcement, Google also said that the change was specifically targeted at reducing spam and low quality content in their organic search results. Momentum towards a big change has been building over the past couple of months. On new years day, journalist Vivek Wadhwa published a Techcrunch article on why we need a better Google. The article focused on how spammy “content farms” were manipulating the search engine algorithm to generate millions of visitors to their low quality but highly profitable websites. The post touched a nerve; it was shared over 5,000 times on facebook and twitter and discussed heavily in the search engine community. A few weeks later, Blekko, a search engine startup competitor, announced that they were banning the top 20 low quality content farms from their index altogether. . While this wasn’t a huge loss for the websites (Blekko only gets about 200,000 total visits each month), it did signal to Google that a bigger change was necessary. Then a few weeks ago, Google slapped J.C. Penny for manipulating the search engine results through these black hat methods. Over the past year, J.C. Penny had generated millions of visitors for terms where they had no business ranking #1, such as “Samsonite carry-on luggage” and “grommet top curtains.” Last week, Google also imposed a similar penalty on Overstock.com. Over the weekend, I looked at data from dozens of sites – everything from high-end business partners, to content farms, to some of my own niche sites – and the single most important takeaway is that sites with unoriginal content are being hit hard. Take a look at the graph below (courtesy of sistrix). Dozens of sites that were getting millions of unique visitors each month have been hammered. Many of these sites have duplicate content that has been copied or “spun” from other sites. A notable exception from the list was Demand Media’s Ehow, which continues to rank highly for many long tail terms. My theory here is that although Ehow’s quality is not super-high quality, it is a) generally original and b) fairly helpful for “how to” terms such as “how to play badminton” where users are just looking for a basic overview anyway. In fact, Ehow may have actually seen a big boost in traffic due to the collapse of some of its biggest competitors. Another great article from Search Engine Journal analyzes some of the biggest winners and losers over the last few days. Having great content has always been the best way to gain organic traffic from Google. Companies like Mint and 37Signals have generated a ton of buzz (and links) by having outstanding content time and time again. This latest change from Google has only augmented this – clearly, in-depth content that generates social media attention and inbound links are ranking better, while low-quality, unoriginal content is being penalized. This creates a golden opportunity for higher-quality content producers. Remember, search is a zero-sum game. There are certainly some big losers, but others stand to gain just as much. And more than ever before, the best content is going to win. The corollary to this is that article marketing, which has been one of my primary SEO tactics in the past, will probably matter less and less unless the articles are really high quality. To learn more about article marketing, check out my free article marketing guide (available at the end of this post). I'll also be sending out updates to my list on how article marketing is evolving as a way to build links and traffic as this continues to unfold. One of the reasons Google hosts tools like Google Analytics is to help them determine which content is most useful, and one strong indicator of “usefulness” is the time people spend on a given page. Through Google Analytics, Google can track a user’s “flow” through your site, determining not only which pages are most popular, but also which pages are retaining users for the longest time. Content farms and other sites usually have very low user retention times, which explains why they are being hit so hard. People usually click through, see a lot of crappy content, and then either hit the “back” button or click on an ad. Another interesting thing to note is that Google did NOT give preferential treatment to its premium Adsense partners. Many of the sites penalized in the above table (including WiseGeek and AnswerBag) were generating Google millions in Adsense revenue each year, but Google clearly didn’t take that into consideration and whacked them anyway. This is a very logical strategy; maintaining their long-term brand is far more important than short-term profits. SEO will always be a game of cat and mouse – Google will make a change, and content creators will figure out a way to game the new system. As such, I see this as just the first of several bigger changes that will likely happen over the next few years. A big area of growth is going to be social media – how do Facebook “likes” and Twitter’s “tweets” factor into the search engine rankings? Will Facebook and Twitter feeds show up as part of results – in the same way YouTube videos and Google News results already are? These are all questions that remain unanswered, but certainly will be relevant going forward. More than ever, it is critical for companies to stay on top of search engine optimization trends as the continue to evolve. Search isn’t going away, but it is bound to change as the internet continues to grow in new and exciting ways. That’s it for the serious discussion – if you’re looking for a quick laugh, check out my video on how Search Engine Optimization Is Like Chasing A Hot Girl. Weet, thansk for this. I'm totally not following SEO changes since Im not big into affiliate marketing and rankings. I'm interested in starting some mini-sites again soon and get them ranking, but for now I'm just working on my blog and own products. Authority sites are always the better option i guess. Google and others can do something about spamming. The irony is that spamming and low quality content have become a big business. I guess there must be lots of money to be made. I consult ehow.com for a brief description of how something works. I get some idea and then do more refined search for more details. I would disagree with whoever considers it spam. High quality and low quality content is in the eyes of the beholder, I guess. As long as it's original, it's OK with me. But if ehow says how to change a bulb, then perhaps many more have done so too. How best can you describe something like that and uniquely? Great post Vik! You highlight all of the major items about how and why we need to move towards smarter, quality SEO. I will contend with your point about GA data being used to determine on-site behaviour and using it for the ranking algorithm. I know it's a common myth but I'm not a believer. One of the biggest reasons why I don't is because most sites on the web have screwed up their GA implementation… and this is Google telling us this. Besides, I see it every day because it's what people ask us to fix :) My point is that content URLs, bounce rates, time on site, etc can be horribly innaccurate and it would actually be dangerous for Google to even rely on that data. 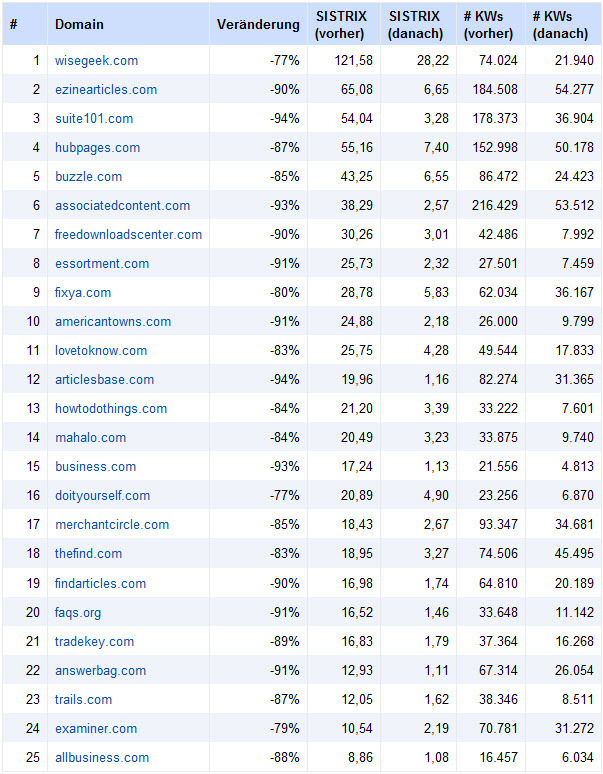 It's very easy for Google to determine site bounces simply by analyize interaction with the SERPs. So, I agree that site behavior is important for Google, but just not through GA.